Hollow structure materials have found important applications in many fields such as catalysis, energy storage and sensors. A facile and environmentally benign synthesis will favor their applications. Here we prepare a cerium oxide hollow structure with the size of micrometers through a simple one-step hydrothermal method. This process results in the formation of microspheres at 210 °C for only 2 h. Advantages of this method include no template, without surfactant-assistance or subsequent treatment during the synthesizing process. Explanation on the controlled crystal growth and hollowing mechanism via Ostwald Ripening is proposed elaborately based on the detailed experiment and observation. The FESEM images showed that the surface morphology of the sphere shell turned from initially smoothness into roughness with the increase of reaction time, relating to dissolution and re-deposition of nanoparticles onto inner and outside of the shell. The hollowing microstructure evolvement was vividly presented by observing samples taken out at different reaction stages, which makes visualization of Oswald ripening process. The prepared Cerium oxide microspheres were used to modify glassy carbon electrode, which acts as a sensor for sensitive determination of environmental hormone catechol (CC), demonstrating superior performance over the solid oxide. This work helps to deeply understand Ostwald ripening from a new perspective. The online version of this article ( https://doi.org/10.1007/s42452-019-0178-0) contains supplementary material, which is available to authorized users. Micro- and nanoscale hollow materials have attracted growing attention for decades, and various hollow structures [1, 2, 3, 4, 5] were prepared in recent years. Hollow materials have shown potential applications such as catalysis , energy storage [4, 7],sensor , and drug delivery ,which rely on intrinsic features of hollow structures, such as high surface area, hollow interior space, high stability, low density and good permeability. Therefore, it is necessary to study how to control the crystal structure and morphology in order to give full play to the potential application value of these hollow materials. Generally speaking, the synthesis of hollow materials can be classified into two cases: template and template-free. 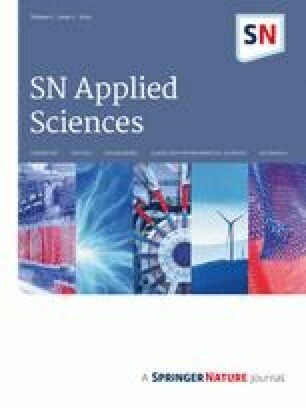 Template assisted material synthesis may utilize hard templates such as silica  ,carbon sphere  ,polystyrene  and metal oxide [13, 14], or soft templates including emulsion micelles  and gas bubbles [16, 17]. However, template synthesis can be time-consuming and expensive, and poor crystallinity materials are often produced during the synthesis process . For example, Titirici et al. reported synthesis of metal oxide hollow spheres by adopting template method during the hydrothermal treatment. Carbon spheres are formed with metal ions incorporated into the hydrophilic shell and the removal of carbon via calcination yields hollow metal oxide spheres. The process contains multi-steps and produces materials with unsatisfactory crystallinity . In contrast, template free approaches toward the synthesis of hollow structures such as galvanic erosion [19, 20], the Kirkendall effect [21, 22], and inside-out Ostwald ripening [5, 23, 24],come with extraordinary advantages, including time-saving and economical, good reproducibility and high yield. Ostwald ripening, a phenomenon which was first described by Wilhelm Ostwald in 1896,  involves the dissolution of small crystals and redeposition of the dissolved species on the surface of large particles, which results in growth of larger domain at the expense of the smaller ones. This phenomenon is thermodynamically controlled because small particles with higher surface energy are unstable. In other words, small partcles with higher surface energy appear to have a higher solubility than the large ones. Ostwald ripening has been widely used to explicate the formation of the hollow interior in a crystal. For instance, Zeng et al. 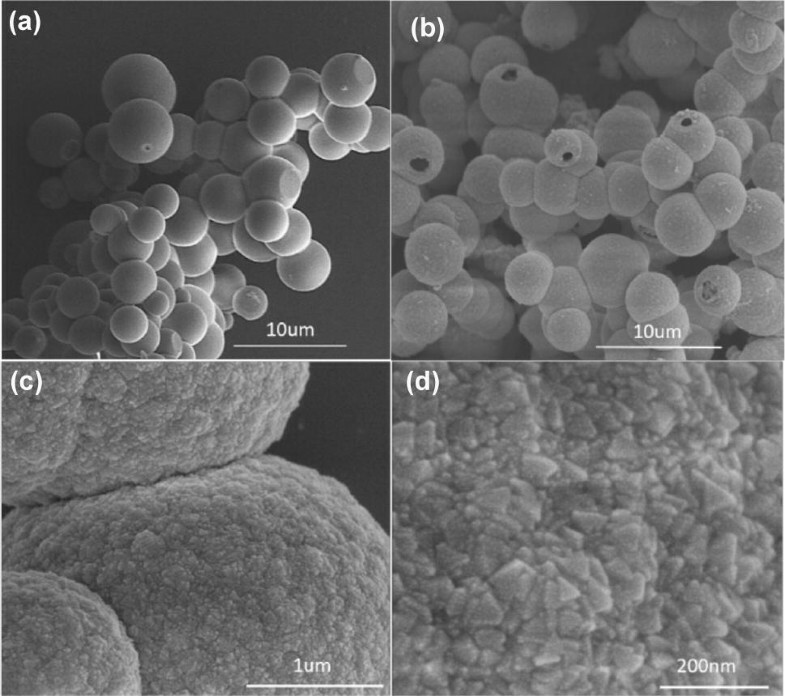 reported for the first time the synthesis of hollow TiO2 nanospheres based on Ostwald ripening mechanism, including the hydrolysis of TiF4 under hydrothermal conditions in a high pressure vessel reactor . The experimental process can be described as follows: Firstly, TiF4 forms amorphous solid TiO2 microspheres by hydrolysis, which is composed of many small crystallites. Secondly, when the reaction time was prolonged, the ripening process occurs by mass transfer between the solid core and the external chemical solution. Finally, the nanospheres eventually become hollow. The Ostwald ripening mechanism also was utilized to synthesize various metal complexes, such as Cu2O, SnO2, ZnS, Sb2S2, NiS and SiO2 [3, 5, 27, 28, 29, 30]. The above-mentioned hollow particles can be used in catalysis, lithium and sodium storage. However, the formation mechanism of these hollow structures was not fully understood. For example, how the matter disappears inside the particle lacks convincing explanation. Direct observation by in situ transmission electron microscopy (TEM) and in situ transmission electron microscopy (X-ray microscopy) is helpful to reveal the mechanism of hollowing, which provide real-time information on crystal structure at different reaction stages [19, 20, 31]. It is observed that Oswald ripening is a dynamic material transfer process. By using in situ TEM, Yu et al. . reported the formation of hollow iron oxide nanorods by decomposition of single crystal β-FeOOH. Unlike previously reported inside-out Ostwald ripening, they proposed a hollowing mechanism termed as “shell-induced Ostwald ripening”, which involves the dissolution and redepositioning of small nanoparticles on the inner surface of the shell to produce cavities. Although in situ TEM observation offers convenience to reveal hollowing mechanisms, the details of shell morphology could not be observed clearly in the event of particles size at micrometer. FESEM, which presents clear morphology of particles from nano to micro size, can reveal the evolvement of the whole surface morphology of the micrometer particles taken out at different synthesis stage to enrich Oswald ripening theory from another perspective. Here, inspired by the Oswald ripening mechanism, we report a new one-step synthesis of CeO2 hollow microspheres to explore surface morphology evolvement without template, surfactant assistance or subsequent treatment. By focusing on the shell evolvement using FESEM to observe entire particles image, we have concisely depicted a hollowing mechanism that enhances previously reported inside-out Ostwald ripening. In our observations, amorphous cores dissolve and nanoparticles redeposit on the interior surface of the shell while small nanoparticles in solution deposit on the outer shell layer simultaneously, generating the hollow cavity and a dense rough shell. This work explains how matter disappears and where it moves. The direct observation of surface morphology using FESEM makes visualization of the Oswald ripening process. The strategy of synthesis and characterization in this study provides general implications for the microscopic morphological evolution of other hollow metal oxide micro- and nanomaterials. The chemicals were obtained from the following sources and used without further purification, which include Cerium(III) nitrate hexahydrate (Ce(NO3)3·6H2O, 99%, Sigma aldrich); Citric acid (C6H8O7·H2O, 99.5%, Shanghai Lingfeng Chemical Co. China); Catechol (C6H6O2, 99%, Aladdin); Sodium dihydngen phoshate anhydrous (NaH2PO4, 99%, Aladdin); and Sodium phosphate dibasic (Na2HPO4, 99%, Aladdin). In a typical experiment, firstly, Ce(NO3)3·6H2O (0.4130 g) and C6H8O7·H2O (0.1000 g)(mole ratio = 2:1) were dissolved in 2 mL deionized water and sonicated for 20 min. The mixture solution was placed into a 20 ml Teflon-lined stainless steel autoclave and heated for 0.5 h, 0.75 h, 1 h, and 2 h at 210 °C respectively. After the autoclave was cooled to room temperature naturally, pale yellow precipitates were collected by centrifugation at 5000 rpm for 3 min and washed three times with distilled water and absolute alcohol respectively, and finally dried under vacuum at room temperature for 8 h.
Before modification, the bare glassy carbon electrode (GCE) was polished repeatedly with 6, 1, and 0.05 μm alumina powders. After polishing, in order to clean the electrode surface, it was washed with doubly distilled water, and sonicated in ethanol and doubly distilled water for 5 min. Finally, it was dried under nitrogen atmosphere and ready for use. For comparison, an amount of hollow CeO2 microspheres and solid CeO2 was dispersed in 5 wt% of Nafion and methanol (1:2) respectively to obtain colloidal sol and the sol was dripped onto the treated GCE. Then the modified electrode was dried at room temperature and subjected for CV analysis. The electrochemical property of the CeO2 microspheres was measured on a CHI 660E electrochemical workstation (Shanghai, China). A conventional three-electrode cell was used. The glassy carbon electrode (GCE) with 3.0-mm diameter served as the working electrode. A saturated calomel electrode (SCE) and a platinum wire electrode were used as the reference electrode and the counter electrode. N2 atmosphere was kept during the whole experiments. 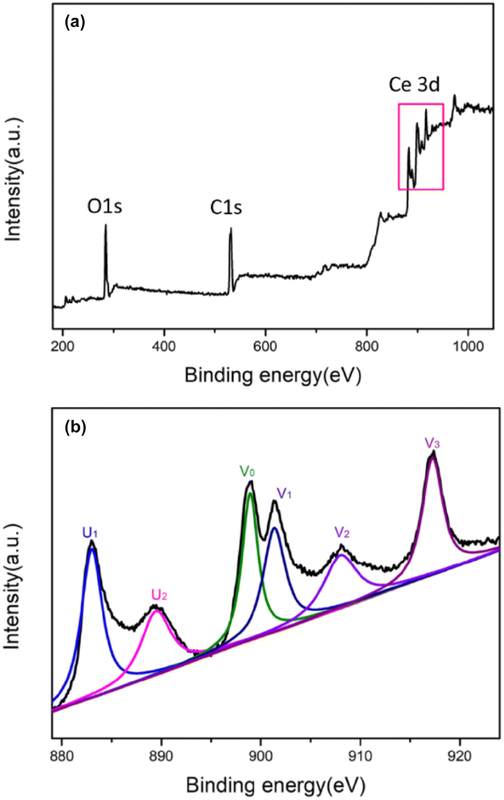 The compositions of the CeO2 microspheres were identified by X-ray diffraction (XRD, Bruker D8 advance, Germany) with Cu target radiation (λ = 0.15418 nm), and range of measurement angle is 20−80°. The microstructures were characterized by field emission scanning electron microscopy (FESEM; FEI Nova Nano SEM 450, America) with an accelerated voltage of 5 kV. The X-ray photoelectron spectroscopy (XPS) was analyzed by PHI 1800 XPS system (Al target, λ = 0.834 nm, Japan). The surface area and porosity of the CeO2 hollow microspheres were investigated by means of Brunauer–Emmett–Teller (BET) analysis and nitrogen adsorption and desorption isotherm at 77 K (ASAP-2020, America). According to the IUPAC definition, Ostwald ripening refers to the “dissolution of small crystals or sol particles and re-deposition of the dissolved species on the surfaces of larger crystals or sol particles” . During Ostwald ripening, relatively small nanoparticles have a greater migration tendency than the larger ones in solution, which increases the possibility of collision and agglomeration. Therefore, with the increase of reaction temperature, the growth of single crystal nanoparticles is at the expense of smaller ones or agglomerated species in the solution. The dissolution of small nanoparticles and aggregates is driven by their higher chemical potential than that of larger particles . To investigate the formation process of CeO2 hollow microspheres, the reaction products after different reaction time are examined in detail with FESEM (Fig. 1). The particle size distribution and the coarsening rate are discussed here with respect to our preparation process of CeO2 microspheres. Obviously, the samples obtained after hydrothermal treatment of 0.5 h contain a large number of solid microspheres, and the growth rate is fast within such a short time. The shell layer looks smooth and a homogeneous core–shell structure appears (Fig. 1a). When the reaction time was prolonged to 0.75 h, the shell looks a little rough (Fig. 1b). We could see clearly that nanoparticles stemming from solution and interior of microspheres are attached to both the outer and inner sides of the spherical shells (Figure S1), which implies that ripening process is on-going. With the reaction time further extended to 1 h (Fig. 1c), obvious separation of the center and edge of the microspheres can be observed, and the cavity becomes larger and the shell looks coarser (see also Figure S2). The contrast between the center and the edge indicates that material transfer has happened. After 2 h the inner core is reduced to the minimum value (Fig. 1d) and the shell looks roughest. The shell thickness of the samples after different reaction time measured by FESEM is about 300 nm. Interestingly, compared with the preliminary spheres (Fig. 2a), the spherical size and the shell layer thickness have not changed much during the Ostwald ripening process (Fig. 2b). 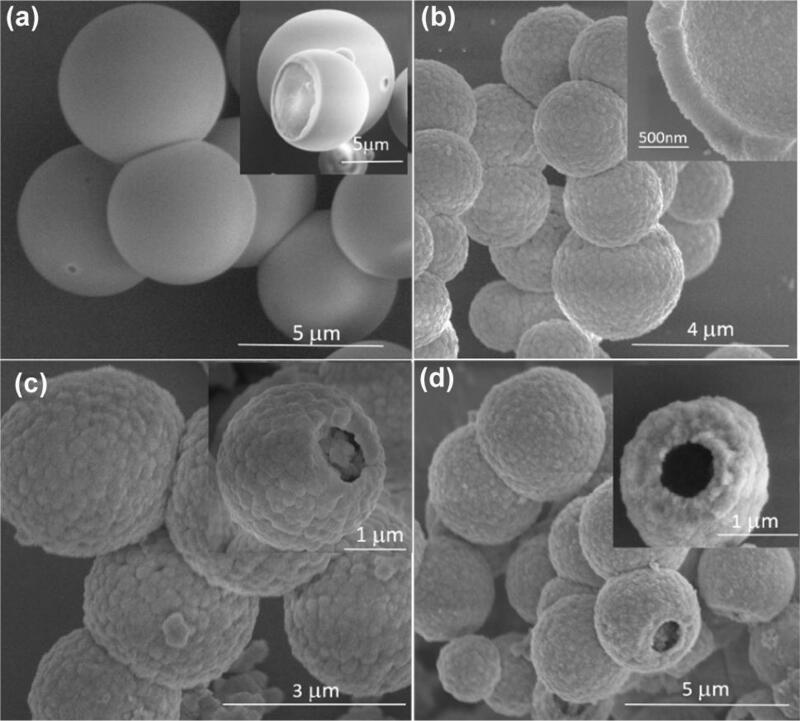 Eventually, the CeO2 hollow microspheres are successfully constructed using nano-polyhedron particles as the building blocks which are packed together densely (Fig. 2c, d), meaning that the density of the shell should become high. It has been found that the ripening process does not cease with the extension of reaction time, while the spherical shell becomes very loose and cracks are generated. The shell was composed of a stack of nanoparticles after a reaction time of 5 h (Figure S3). Therefore, the optimal Ostwald ripening time is 2 h.
where Dm is the molecular diffusion coefficient of the internal phase, and aN is the number-average particle radius. At any instant of the ripening process, there exists a critical radius ac. During the ripening process, ac increases with time. Most coarsening processes exhibit interesting theoretical characteristics because the size distribution of particles does not change with time when the radius equals ac. This extraordinary behavior is often referred as “self similarity”. The particle size distribution can be derived below in the stationary regime, not the transition from an initial situation (freshly prepared dispersion or emulsion) toward the stationary regime. The critical radius ac is equal to the number-average radius aN of the limiting self-similar size distribution. Equation (3) implies that no particles with sizes larger than 1.5 times the average size are present in the stationary regime, simultaneously accounts for various particle sizes existing in the hydrothermal system. Powder XRD investigations (Fig. 3) reveals the variation of crystallinity and crystal phase in the whole reaction process. All peaks are readily indexed with JCPDS No. 43-1002, corresponding to cubic fluorite structure of CeO2. Diffraction peaks of the materials between 2θ values of 69°–80° are weak for the sample at a reaction time of 0.5 h, which indicates that the crystallinity is poor and the degree of disorder is high. The crystallinity of the material increases gradually when the ripening time is prolonged to 2 h, and the morphology of the particles changes significantly due to nucleation and ripening (Fig. 2). This process is related to the gradual redistribution of the matter from the core to the shell of the microspheres. To further investigate the surface composition and the chemical states of the as-prepared materials, XPS analysis were characterized. Peaks of C 1s, O 1s, and Ce 3d can be identified from the survey spectra in Fig. 4a, which indicates the high purity of the sample. Figure 4b displays the Ce 3d spectrum of CeO2 microspheres, which can be deconvolved into six peaks. The peaks labeled as U1, V0, V1 and U2, V2, and V3 are the characteristic peaks of Ce3+ and Ce4+ respectively. The results indicate the co-existence of Ce3+ and Ce4+ states in CeO2 microspheres, which is consistent with the previous literature reports [46, 47]. Additionally, The textural porosity of the CeO2 microspheres were examined by N2 adsorption and desorption analysis. The results (Figure S4), indicate that the isotherms correspond to type IV and the CeO2 hollow microspheres sample is a mesoporous material. The corresponding pore size distribution curve calculated by the Barett–Joyner–Halenda (BJH) method using the desorption branch of the isotherm shows the spheres have a narrow pore size distribution from 1 to 10 nm with most pores lying in near 2.5 nm. The surface area of the CeO2 microspheres with 16.7 m2/g is higher than the value (8.5 m2/g) of the commercial CeO2 powders  measured by the Brunauer–Emmett–Teller (BET) method. In the past decades, various analytical techniques such as spectrophotometry, chemiluminescence, chromatography [49, 50, 51] have been employed for the detection of catechol (CC) which is an emerging contaminant with severe toxic effects. However, these methods are relatively expensive and time consuming. Remarkably, electrochemical sensors have received considerable attention for environmental monitoring because of their portability, excellent sensitivity, automation, short analysis time, low power consumption and inexpensive equipment . Due to the presence of phenolic hydroxyl groups, CC can be oxidized and exhibit electrochemical activity. We investigated redox activity of the as-obtained CeO2 hollow microspheres through cyclic voltammetry. The CV curves of CeO2 modified electrode at various scan rates are displayed in Fig. 5a. Both the anodic and cathodic peak currents increase with scan rates. Besides, there is a slight shift in the peaks with increase of the scan rate. In comparison with the solid CeO2 as shown in Fig. 5b, the hollow CeO2 microspheres modified electrodes exhibit larger peak current and more negative onset potential, indicating that the hollow CeO2 microspheres show much better electro-catalysis activity. The formation of mesoporous CeO2 shells and hollow structure is favorable for the fast diffusion of reactants and products from the active sites, which is beneficial for increasing catalytic efficiency. In Fig. 5c, with the increase of CC concentration from 0.1 to 1.0 mM, the CV curves of CeO2 microspheres at a scanning rate of 100 mV S−1 are given. 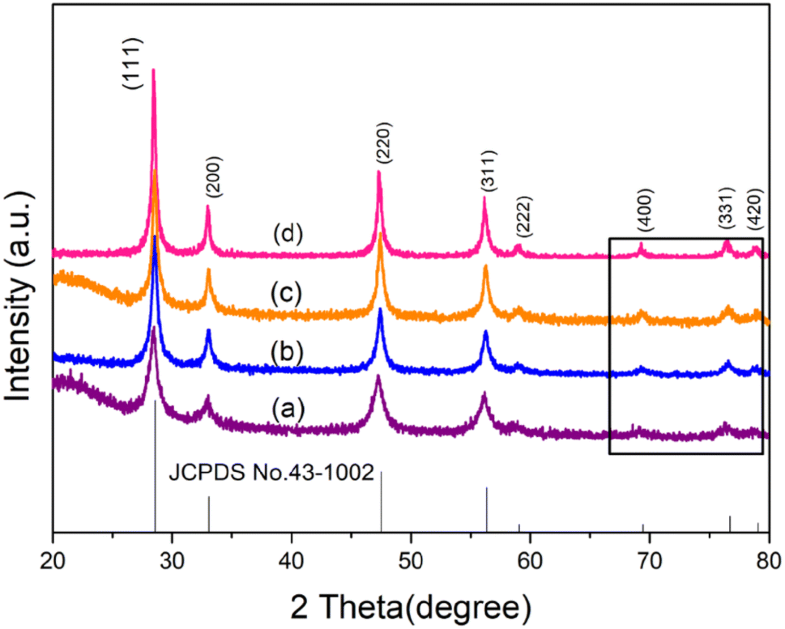 Obviously, the peak current increases regularly with the addition of CC into the PBS (Phosphate Buffer Solution), showing the stable and reversible electrocatalytic activity of the CeO2 microspheres modified GCE. The calibration curve of CeO2 microspheres modified GCE is shown in Fig. 5d. The linear regression equation is Ip = 0.0646 + 25.438C with the value of correlation coefficient of 0.9987(R2). The results clearly confirm that the testing process is a diffusion-controlled process. The low detection limit is calculated using the equation : Limit of detection(LOD) = 3Sb/q, where Sb is the standard deviation of the blank signal, and q is the slope of the calibration curve. The calculated LOD is 0.011 mM. 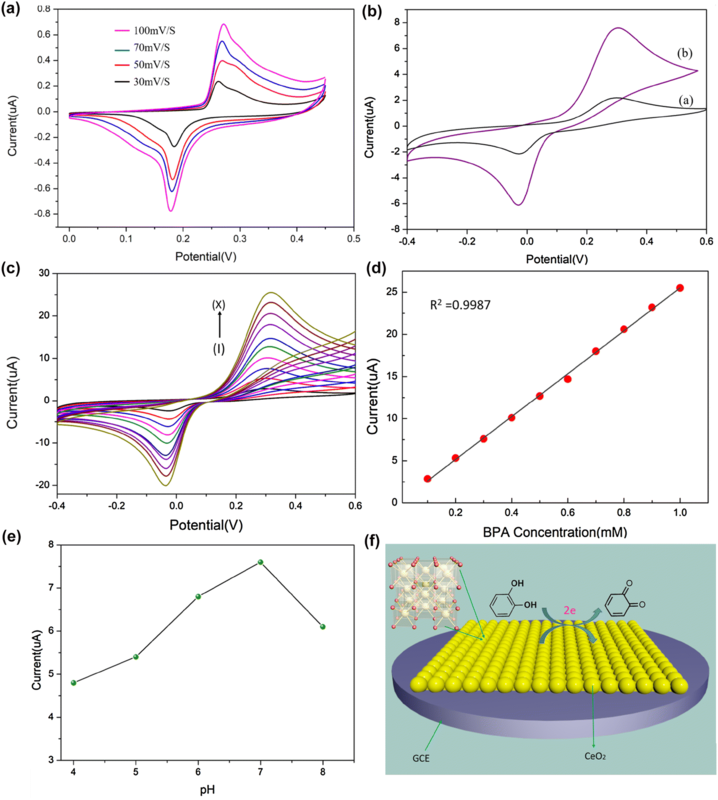 The influence of solution pH on the electrocatalytic oxidation of CC at the CeO2/GCE was investigated by CV in the pH range of 4.0–8.0. As shown in Fig. 5e, the variations in the CV currents at different pH values indicate that the maximum current response can be obtained at pH 7.0. Therefore, 0.1 M PBS with pH 7.0 was used as the supporting electrolyte in all voltammetric determinations. Figure 5f illustrates the possible mechanism for the detection of CC. When CC is oxidized to 1,2-benzoquinone, two free electrons are released, which are absorbed by CeO2 loaded on the surface of GCE, leading to generation of electric current . This redox behavior demonstrates good electrochemical activity of the prepared CeO2 microspheres with hollow structure. In summary, we developed a new facial hydrothermal method to prepare uniform CeO2 microspheres without a template. This process possesses outstanding advantages including time-saving, low cost, good reproducibility and high yield compared with traditional template-directed strategies. The mechanism of controlled growth and hollowing of the microspheres via Ostwald Ripening was proposed elaborately based on the detailed observation. The FESEM images vividly showed the evolution of the surface morphology of the sphere shell. The phase transformation occurred on a stable crystal region (shell layer) so that the uniformity of crystal structure was maintained, which explains clearly how matter disappeared and transferred, to which little attention has been paid in the previous reports. The direct observation of surface morphology evolvement of CeO2 from a solid core-shell structure to a hollow microsphere with FESEM makes vividly visualization of the Oswald ripening process. The material was electrochemically active and could be explored for more applications like catalysis owing to its prominent redox ability. This work was financially supported by the National Natural Science Foundation of China (51777209), Guangdong Provincial Key Laboratory (2014B030301014), and Shenzhen Peacock Program (KQJSCX20170731163718639).